My Cannatonic Incognito results are not going to be the same as your results. Not being rude… just the facts here. Everyone that grows, grows using techniques and technologies that are available to them, such that no individual grower can replicate the results of any other. You can come close, but it is never the same. Therefore, please do not use this info to create expectations for your own crop yeild. Everyone will have different experiences growing a certain strain; I am just sharing my experiences with you. Also, I used to try to lay out a history for the strains that I am covering here, but I have found cannabis strain histories to be virtually impossible to accurately detail. Due to this, I have limited the detail to which I describe the history of strains to my pages. Thanks for reading my site. I hope you enjoy the information. I live in Seattle Washington, land of awesome cannabis and amazing medical marijuana growers. Today, I am going to introduce you to the Cannatonic Incognito (very high CBD/very low THC) Hybrid Medical Marijuana Strain. Typically, the Cannatonic strain has risen to fame because of it’s usually equal amounts of both THC and CBD’s; a ratio of 1 to 1 that has fast become a favorite strain for medical marijuana patients. CBD’s can be found in most strains of marijuana and are well known for their ever expanding list of medical benefits. Medical marijuana patients who find benefit from high CBD strains of marijuana simply seem to adore the Cannatonic strain but would like to see a strain come onto the market with equal or higher levels of CBD’s and significantly reduced levels of THC; allowing the same benefits from CBD’s while eliminating (if possible) the psychoactive effects produced by the THC. A number of weeks ago, I received a call from a close associate of mine; he was really excited about something and wanted me to come up and check it out. Long story short, this grower, who will remain unnamed for now, has produced a CBD strain that is the absolute top of its class. The hybrid strain is called Cannatonic Incognito. Cannatonic is well known in the medical marijuana industry for its higher CBD content and its equal or reduced THC cannabinoid levels. Once tested (by Anylitical360.com), the true nature of this new hybrid strain became clear. According to Analytical 360.com’s testing results, this particular hybrid strain has some amazing properties. This offshoot of the Cannatonic strain has 15.82% total CBD and 1.06% total THC. 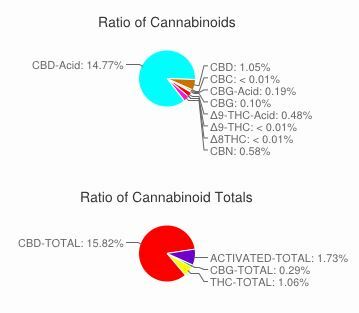 That’s right… CBD’s near 16% and barely above 1% THC. A high CBD strain without the psychoactive effects of THC. These numbers were, quite frankly, astounding. Many Cannatonic CBD strains have elevated levels of CBD’s, with the usual caveat that the THC levels are not as low as the cannabis medical patients would prefer. The lower levels of THC are preferred for the medical CBD strains due to the reduced psychoactive effects resulting from the lower amounts of THC. Research on high CBD medical marijuana strains has found anti-inflammatory and analgesic, as well as anti-anxiety properties. Those rare high CBD strains with significantly reduced levels of THC provide all of the benefits of a quality CBD strain without the ‘stoned’ or ‘high’ feeling. C.I. (Incognito) = MK Ultra female x G13 Haze male. This plant is a Indica Sativa hybrid to be available by clone only. This cannabis strain smells and tastes like a sativa but grows like an indica. The most common flavors put forth by this strain are: lemon and pine – really very tasty!! This particular Cannatonic hybrid strain exhibits short branching due to the close internodes. As an outdoor plant or greenhouse plant Cannatonic Incognito – has the potential to become much larger. Trimming is just less than average due to the leaf structure and compact growth qualities of an indica. The quality of the yield is is just amazing. Big fat buds on every part of the plant. I can’t wait to see how big this strain gets during the next round. Flowering period of 63 to 70 days, that’s about 9 to 10 weeks. The actual origins of the Cannatonic Incognito cannabis strain are well known. Cannatonic Incognito came from the cross of an MK Ultra female and a G13 Haze male. It is commonly found on the west coast of the United States. Dirt based mediums, hydroponics, grown indoors and outdoors. Have had absolutely no issues with getting cuttings to root. In fact, the pics on this page are rooted cuttings taken from the mother plant. You know, I really don’t like trying to figure out expected yield. Absolutely everything from plant size to nutrients, pH, light spectrum, soil, plant structure, bugs, etc. effects the yield of a strain. What I can tell you about these particular plants is that they were grown to a height of about 5 to 6 feet tall (including the container). In general flowering terms it will finish at 9 or 10 weeks, indoor. In the northern hemisphere (USA, Spain, Italy, France etc.) this strain will finish in early-mid October. The Cannatonic Incognito cannabis strain has significant medical benefits that last longer and come on stronger than most other high CBD strains. The effects are uplifting, mood elevating and it is well known for it’s ability to abate pain. If you have access to some Cannatonic cuttings – and you have the inclination and the room in your operation to add a few of these babies to the rotation – you would surely be making a solid decision. Get some, try it, think about it. You wont regret it – and you’ll feel great as well!